Guns of Icarus has had an interesting life. What started as a web-based airship combat game eventually turned into the more full-featured Steam release Guns of Icarus Online. The co-op play for the series has always been unusual, allowing teams of players to work together to battle rival airships in some intense rounds of mid-air combat. Even still, the game was a bit thin under the surface, offering a lot of combat with very little else. All that's about to change. Developer Muse Games recently started a Kickstarter project for Guns of Icarus Online: Adventure Mode, an ambitious update that will add features such as towns, player factions, economics, trading, and AI-controlled team members, all in a persistent player-run steampunk world. Co-op play will be largely the same as before, though now the crew you join will have a complete world to inhabit instead of just strings of battles to complete. The update sounds impressive, but we're really curious to see how this will affect co-op play, especially with the addition of AI-controlled teammates. 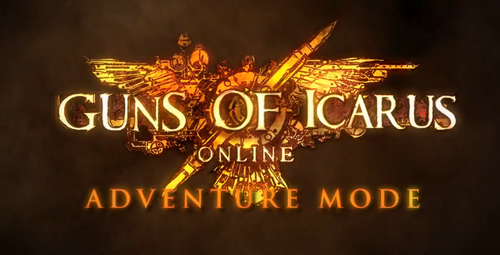 The Guns of Icarus Online: Adventure Mode Kickstarter is open for pledges until May 21. Page created in 0.6997 seconds.